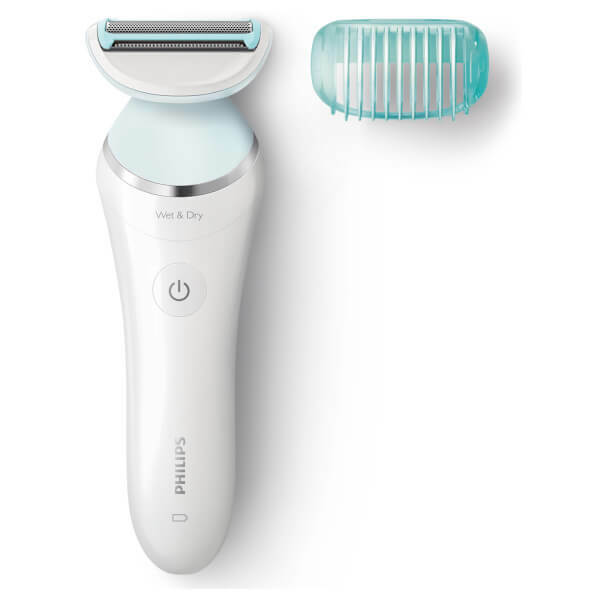 The Philips SatinShave Advanced Wet and Dry Electric Ladyshaver BRL130/00 is a rechargeable electric shaver developed specially to perform a close, comfortable shave on sensitive skin. The cordless shaver utilises a floating foil system, which ensures blades glide effortlessly over curves and contours of the body, maintaining contact with skin for a close shave. 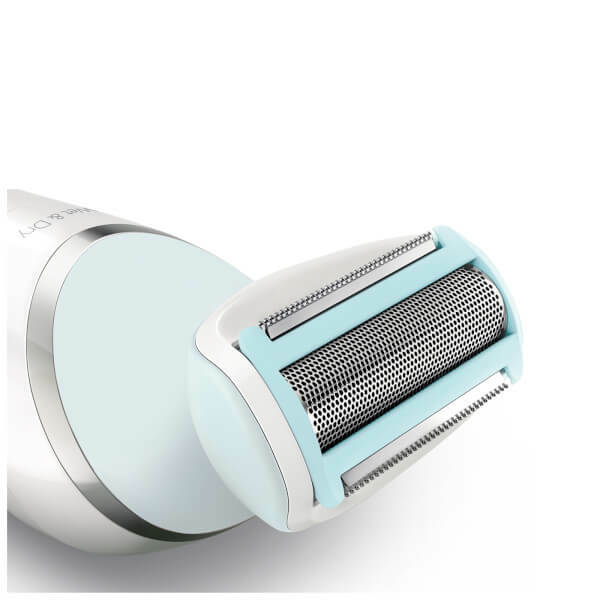 The trimmer has rounded, pearl tips to prevent blades from scratching skin, while soft-touch comfort cushions on both sides of the head provide a smooth pass that feels gentle on skin. Suitable for both wet and dry use, the shaver makes hair removal easier and more comfortable. It's ergonomic, S-shaped handle enables maximum control, allowing you better reach and precise movement over contours of the body. Suitable for even the most sensitive areas, including legs, body, bikini line and underarms. Switching the appliance on and off: To switch on the appliance, press the on/off button once. To switch off the appliance, press the on/off button once more. Attaching and detaching heads: To attach a head, press it onto the handle. To detach a head, press the release button on the back of the appliance. back but at the sides. Shaving and trimming: The appliance is suitable for use in the bath or shower, but you can also use it dry. If you want to use creams or body lotion, apply them after you have used the appliance. Note: The appliance can only be used without cord. Note: When you use the appliance to trim hairs, use it dry for the best result. Place the appliance on your skin in such a way that the attachment or accessory is in full contact with the skin. When you use the appliance on sensitive areas, stretch the skin with your free hand. When you use the appliance on your underarms, raise your arm and put your hand on the back of your head to stretch the skin. Move the appliance slowly against the direction of hair growth. Note: If you move the appliance over your skin too fast, you may not obtain a smooth result. You can use the shaving head to shave your legs and body. Note: The appliance can be moved in two directions, for easier shaving of underarms. Note: Always check the foil before use. If it is damaged in any way, replace the cutting unit right away. Trimming comb: You can attach the trimming comb onto the shaving head to trim hairs to a length of 3mm. Skin stretcher cap (BRL140 only) You can attach the skin stretcher cap onto the shaving head to make the hairs stand upright during shaving. This makes it easier to remove them. Soft glide cap (BRL140 only) You can attach the soft glide cap onto the shaving head to cover the back trimmer of the shaving head for extra safety in curvy areas. The smooth material makes it glide effortlessly over your skin. Make sure that you attach the soft glide cap in such a way that the back trimmer of the shaving head is covered).